The First Aid Kit Therapeutic Balms were developed and designed with the intention of providing a complete bathroom cabinet DIY kit for everyday ailments throughout the year. Here, Tara Gould looks at three that are really useful at treating a range of cold weather ailments. Many of the products that Amanda has created and refined over the years are the result of her striving to find remedies for herself, her family and clients who have approached her looking for relief from certain complaints. This week, the ubiquitous ‘Beast from the East’ will be causing the country to grind to a standstill as, predictably, the UK infrastructure struggles to cope with a layering of snow and freezing temperatures. Some of us will celebrate the school closures and travel restrictions, giving us the chance to revel in the drifts, and hurtle down pristine hills on primary coloured plastic. But the dramatic drop in temperatures can trigger all kinds of physical ailments, including coughs and colds, dehydrated skin, and stiffness and aching. Here’s an armoury of A.S.APOTHECARY therapeutic balms designed to ease cold weather complaints. In cold weather achiness often increases and is most common in weight-bearing joints, like the knees, hips, and ankles, particularly for outdoor runners and walkers. When temperatures drop, to conserve heat, the body directs more blood to the organs in the middle of the body, such as the heart or the lungs, causing constriction in joints, which can result in stiffness and discomfort. Also, changes in barometric pressure in cold weather can cause an inflammatory response in the joints, which might also cause pain and stiffness. Flex & Extend was designed primarily as a post exercise balm to support movement and bring relief to aching muscles and limbs. But its therapeutic ingredients are also very effective at reducing general joint discomfort and the associated stiffness and pain of arthritis and rheumatism, something I can personally testify to as I use this balm regularly to bring relief to my achy right knee. 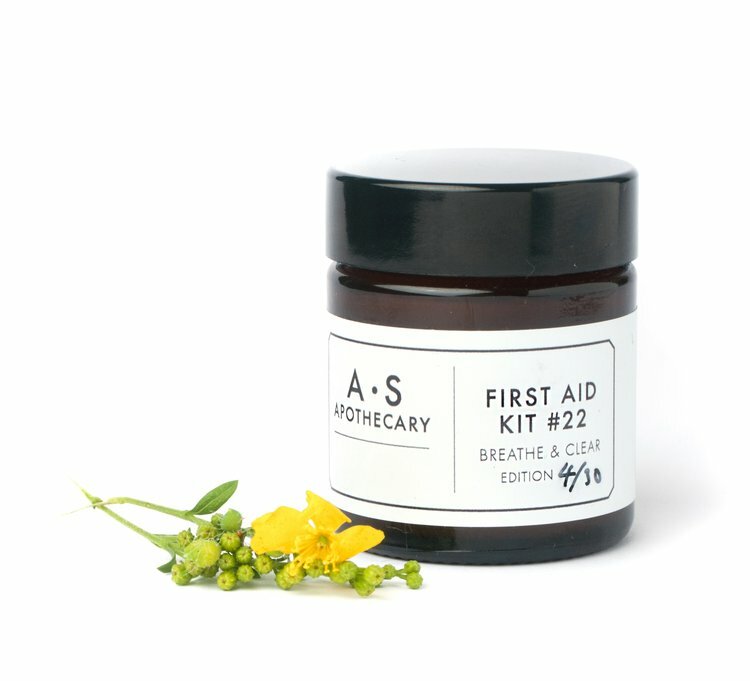 The balm contains a carefully picked selection of herbs and plant extracts which specifically target mobility, muscle and joint issues, such as Meadowsweet from the Hebrides for its anti-inflammatory properties, Juniper for its anti-rheumatic properties, and our own Sussex Lavender Angustifolia to relax the body. Rosemary, which I have written more about in this February ‘Plant of the Month’ article, is another powerfully healing herb included for its analgesic and warming properties. To this mix Amanda adds some key Homeopathic remedies: Rhus tox for stiff, aching joints; Arnica for muscle pain and Ruta for stiffness and inflammation. Massage directly into affected areas, after exercise, a long day's work, or whenever joints or limbs are aching or painful. Earlier in the year, we were really pleased when Heather from the Little Natural Company put out an Instagram post saying how much our Breathe & Clear had helped relieve her daughter’s chesty cold and cough. This resulted in a flurry of orders and, later, many excellent responses to this little rescue balm. It is gentle enough to use on children over 3 years old, and it helps clear blocked passages, relieves sinus pain and relaxes and soothes coughs. It’s replete with respiratory supporting herbs and remedies such as Thyme and Cedar, which are anti bacterial, anti septic and excellent expectorants for loosening and expelling mucous. Orange oil reduces irritation, and the four snot busting homeopathic remedies, Kali bich, Hydrastis, Pulsatilla and Kali mur are all superb at clearing mucous and phlegm. Rub on the chest, drop into hot water to steam, or apply sparingly in a dot under the nose for inhaling. Feeding back, a few mums told us they had rubbed the balm into their children’s feet to relieve cold symptoms and this seemed to work wonders. Parched & Dry is a super intense moisturising balm for very dry skin and is also good for the relief of eczema and psoriasis. Amanda initially created this little pot of skin salvation in response to numerous requests over the years from people who experienced eczematous type breakouts,. Powerfully moisturising, softening and protecting ingredients make up the base, such as Raw Shea Butter, Beeswax and Almond oil and to this a complex recipe of herbs and plant oils are added for their healing, conditioning and antioxidant properties. Use daily on effected areas. Use sparingly as it goes a very long way. Top tip: I find my heels and elbows become really dehydrated and flaky in winter. Face cream is something I never forget to apply, but those hidden places get neglected. To remind myself I put a pot of Parched & Dry by the kitchen sink, then apply to my hands after washing up, and also rub a little scrape onto my elbows while I’m at it. You can read more about how to treat dry winter skin, here, in my previous article. We would love to hear your thoughts, requests and feedback, so please leave comments or stay in touch. For a 10% discount from online orders and to receive offers, news and info about events please subscribe to our newsletter, just scroll down on the home page.